Welcome to our Captain Cooks online casino review, where we will take an in-depth look at Captain Cooks, its bonuses, deposits and security. 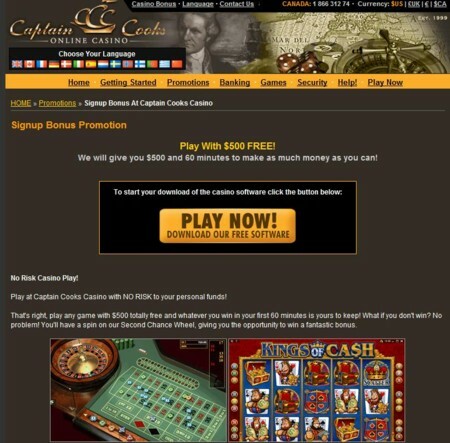 Captain Cooks Casino knows how to attract new players by offering a $500 free bonus, but they also know how to keep their players coming back for more. This award-winning online casino offers high quality games, very strict security measures and some of the best customer service providers available today. Be careful not to use just any no deposit bonus. Captain Cooks give you the chance to make use of a no deposit bonus in their world-class, secure casino. Get $500 for free and one hour to win as much as you can! Simply download their software to make use of this bonus and to experience their terrific games and lucrative 97% payout rate. They also have a variety of other online casino bonuses on offer, and they regularly update their special offers page. 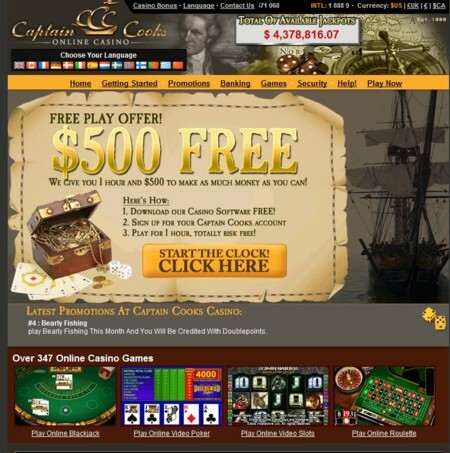 It’s a good idea to check in with their website once a week to stay in the know of the latest promotions, or you can simply sign up for their Captain Cook Casino e-mail newsletter. It is very simple to make a deposit at Captain Cooks online casino. Before you can start enjoying the benefits of being a ‘real player’ you will have to make a deposit into your Captain Cooks Casino real money account. To make a deposit click on the casino’s Bank button, which will take you to the casino’s ATM. You will immediately see the deposit screen, where you can choose your preferred deposit method, whether this is credit card, bank deposit or using a third party payment method. Wire Transfer, QuickTender, EcoCard, Visa Debit, Click2Pay, Moneybookers, Visa Electron, Neteller, Visa and EZIPay and only deposits by Diners, MasterCard and EntroPay. New players will first have to register their payment account details. The casino is a member of the IGC or Interactive Gaming Council, which strives to guarantee fair and secure gaming. They use random number generators which are independently reviewed on a regular basis, and the results of which are published on their website by Independent Auditors. Captain Cook Casino is powered by the popular Microgaming (Viper). Captain Cooks online casino also uses the very latest in 128 bit encryption to make sure that your personal details stay private. It works by encrypting any private data you send to them via the internet, making it impossible for other people to read. And should you ever have a question about security or about anything else regarding Captain Cooks online casino, do not hesitate to contact their friendly customer service team, day or night. You can speak to them via telephone, instant chat, or e-mail, no matter where you are in the world. We have come to the end of our Captain Cooks online casino online casino review. The best way to discover what Captain Cooks online casino is all about is to try it out for yourself. Why not visit their website now and try out their bonuses to see if you enjoy this casino as much as we do. Captain Cook Casino also accepts US players.